Race car 1 honks look at me! He zooms in front with the turn of a key. Race car 2 is close behind. The sound of "vroom" is on his mind. 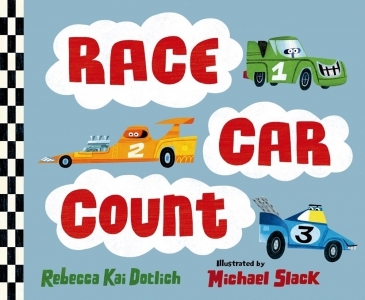 The simple, rhyming text is perfect for reinforcing counting with young children, and the vibrant, energetic illustrations of ten cars - all with different personalities - make this a terrific board book package for young vehicle enthusiasts. Now in board book! 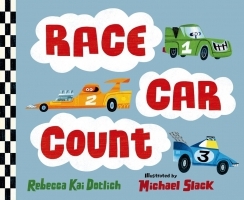 As ten little race cars compete in a race, preschoolers can count along till the big finish.